Free and Accepted Masons of the State of California. It is his duty to “Set the Craft to work and give them wholesome instruction for their labor”. The Treasurer of a Masonic Lodge is the Chief Financial Officer of the Lodge. He sits to the right of the Master and behind the Senior Deacon. The Treasurer is responsible for all financial transactions. He receives all money, pays all debts by order of the Worshipful Master with the consent of the lodge and renders a report when requested. The Treasurer’s duties can be likened to a corporate C.F.O. (Chief Financial Officer). The Secretary’s Lodge Officer duties are many, not the least of which is that he must be well versed in Grand Lodge By-Laws for his jurisdiction and his Lodge By-Laws. He keeps the list of Lodge members and helps the Master organize his meetings. A very experienced member usually resides in this chair…many times he is a Past Master of the Lodge. While it is not a prerequisite, due to the number of hours that this position requires, most (not all) Lodge Secretaries are retired and therefore able to devote the many hours required which are necessary to this position. The Secretary’s position is similar to a corporate C.O.O., (Chief Operation Officer). His Jewel of office is an opened book, symbolizing the Volume of Sacred Law (the Christian Bible, Hebrew Torah or Tanach, the Muslim Qur’an, the Hindu Veda, the Zoroastrian Zend-Avesta, or the Proverbs of Confucius). It’s simply referred to as the Volume of Sacred Law. This is a nonsectarian term representing the Holy Book held sacred by members of that lodge. The Chaplain of a Masonic Lodge is an appointed officer of the Lodge. He sits to the left of the Master. The Chaplain is the spiritual leader of the Lodge. While he may or may not be a real-world Minister, Priest, Rabbi or Imam,… in the lodge, the Chaplain is responsible for non-denominational prayers at both the opening and closing of meetings, during degree ritual ceremonies and before meals. Most Chaplains have no religious training and prayers are non-denominational. The Chaplain’s position is similar to a Supervisor. The Junior Deacon of a Masonic Lodge is an assistant officer of the Lodge. 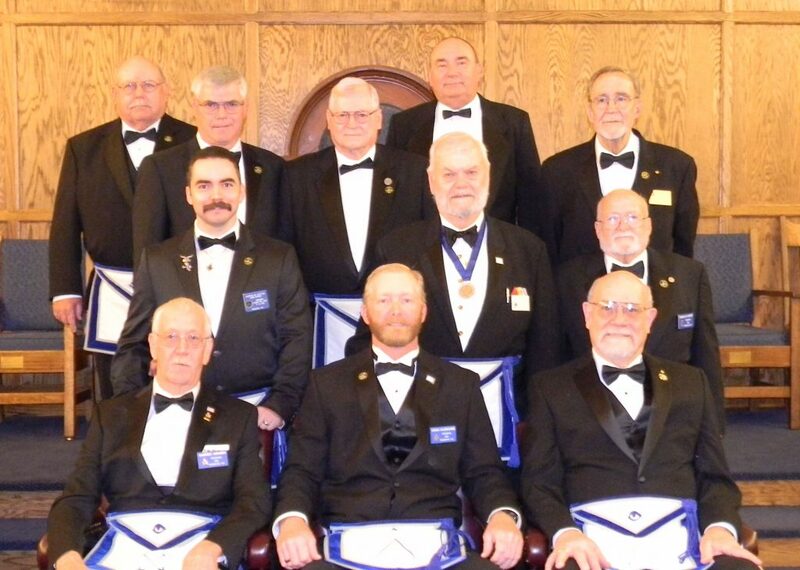 He sits to the lower right of the Senior Warden. The Junior Deacon’s principle roles are to assist the Senior Warden by carrying messages from the Senior Warden in the West to the Junior Warden in the South and to guard the inner door of the Lodge. It is his duty to ascertain at all times whether the Tiler is guarding the door and only allowing visitors to enter after they have been properly vouched for. The Junior Deacon and the Tiler communicate with each other by knocking on the door (the Tiler from the outside…and the Junior Deacon from the inside). Some jurisdictions split this position into 2 positions…that of the Junior Deacon and the Inner Guard. The Junior Deacon’s position is similar to a Manager. His Jewel is the Lyre. The Organist is the Director of Music and provides musical accompaniment to lodge procedings. Many lodge rooms are equipmented with a pipe organ or electric organ and in others their are provisions for a wider range of instruments. The Director of Ceremonies or Ritualist is responsible for the smooth flowing of ceremonial and ritual and may hold rehearsals. He may be responsible for prompting officers who forget their lines. The Candidate’s Coach fills the role as mentor and his duty is to promote the Masonic development of the Brethen within the Lodge. By doing so he will help to lay that solid foundation which is an essential part in helping and educating young Masons to understand and enjoy Freemansonry.